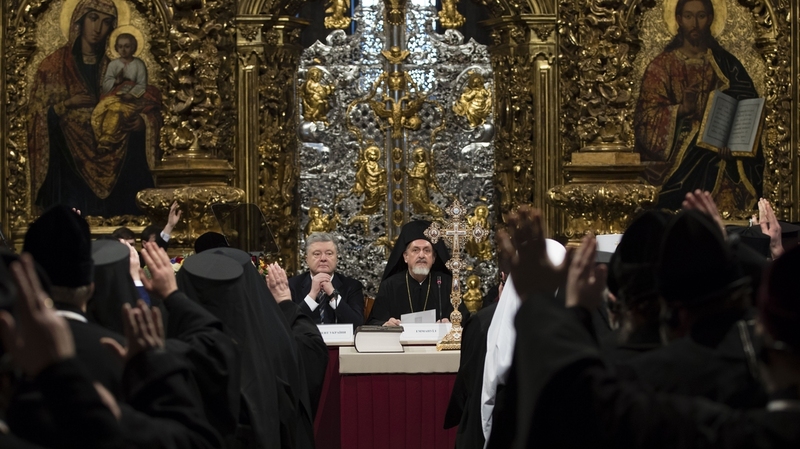 Ukraine Moves To Form A Unified Orthodox Church Independent From Russia The move comes at a time of heightened tensions between Russia and Ukraine, and has already drawn condemnation from Moscow. Ukrainian President Petro Poroshenko attends a synod of three Ukrainian Orthodox churches to elect leadership of a new unified church in the St. Sophia Cathedral in Kiev, Ukraine. Ukraine elected the head of a newly unified Orthodox Church this weekend, a move that the nation's president hailed as an important safeguard against future Russian aggression. The church aims for independence from the Russian Orthodox Church, and Saturday's election is just one step in a process that could take decades. Nearly 200 bishops, priests and other church officials elected 39-year-old Metropolitan Epiphanius on Saturday as the Ukrainian church's head. "Today is a truly historic event," Metropolitan Epiphanius said, according to The New York Times, "We were able to overcome various temptations, disagreements and unite in one church." Ukraine's president, Petro Poroshenko, said the creation of an independent, national church is essential for national security because Russia is using churches in Ukraine as tools to spread propaganda and provide support for Russian fighters. Poroshenko is up for re-election next year, and critics argue his push for an autonomous church is a campaign ploy to bolster support. On Saturday, quoting a national poet, Poroshenko said that "Ukraine will no longer drink Moscow poison from the Moscow cup," and called the election of the church's head "the final acquisition of independence from Russia," reports the Times. The Times reports that Ukraine's split from the Russian Orthodox church threatens Moscow's "longstanding effort" to portray itself as the protector of all 300 million Orthodox Christians worldwide. Ukraine's churches have been beholden to Moscow for centuries, and Russian President Vladimir Putin and Patriarch Kirill, the head of the Russian Orthodox Church, have "pursued a 'Russian World' alliance of states bound to Moscow by tradition, culture and religion." The Russian Orthodox Church could lose 30 to 40 percent of its 150 million-person membership in the split, according to the Times. Russia has responded to attempts to create an independent, unified church in Ukraine with condemnation, comparing it to the great schism of 1054 that divided western and eastern Christianity. The Kiev Patriarchate began after the collapse of the Soviet Union. "It favors European integration and champions an independent church but the Moscow Patriarchate denounces it as schismatic," reports Reuters. Religious divisions in Ukraine deepened and support for the Kiev Patriarchate grew after Russia's annexation of Crimea in 2014. "That which was created over hundreds of years was destroyed by Putin and his idiots in four years," Alexei Navalny, a Russian opposition figure, wrote on Twitter. "Putin is the enemy of the Russian World." In the run up to this weekend's election of an independent church leader, Ukrainian security services raided several Moscow-backed churches. According to Reuters, Ukraine "worries Russia is using the Ukrainian Orthodox Church (Moscow Patriarchate) to incite tensions as cover to invade." "The deliberate instigation by the Russian special services of inter-church conflicts in Ukraine, to be combined with provoking direct acts of terrorism, may become a pretext for open military invasion by the Russian Federation's armed forces of our country," Vasyl Hrytsak, the chief of Ukraine's security service, said, according to Reuters. The church split comes at a time of heightened tensions between Russia and Ukraine. Last month, Russia seized three Ukrainian naval vessels and 24 soldiers and security officers traveling through the Kerch strait between Russia and disputed Crimea. Over the weekend, the Times reported, "Ukrainian officials have been raising alarms about what they say is a huge buildup of Russian troops, tanks and artillery pieces along their border that could signal preparations for an invasion." Epiphanius is scheduled to travel next month to Istanbul to receive an official order granting autonomy to the Ukrainian Orthodox Church. Istanbul is the historical seat of the Eastern Orthodox Church, and gave its backing to the establishment of an independent, unified Orthodox church in Ukraine last October.